Happy National Cheeseburger Day! On an unrelated note, let me tell you about the most awful thing I've eaten in dessert memory. 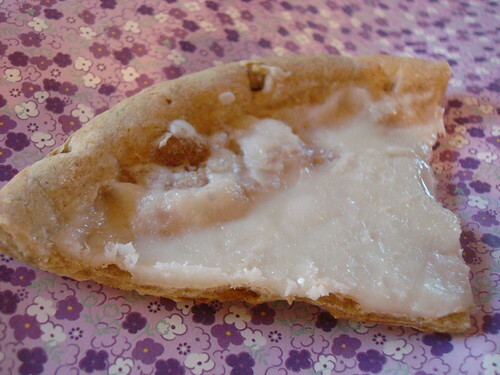 It was dessert pizza from the dollar store. I know what you're thinking. You're thinking, "what were you thinking, CakeSpy?" What can I say? It appealed to my thrifty nature. 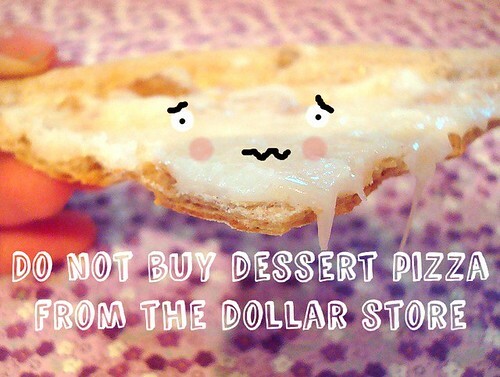 Plus, the novelty of finding dessert pizza at the dollar store was pretty wonderful. It seemd like a pretty nice haul for just a buck. I took it home and ripped that baby open. Now, to its credit, the actual making-of was kind of fun. First, you take the crust, which is nestled on its own little cardboard circle and requires no pan! out of the package. Next, you take out the enclosed icing (the "cheese"?) and pour it on top. 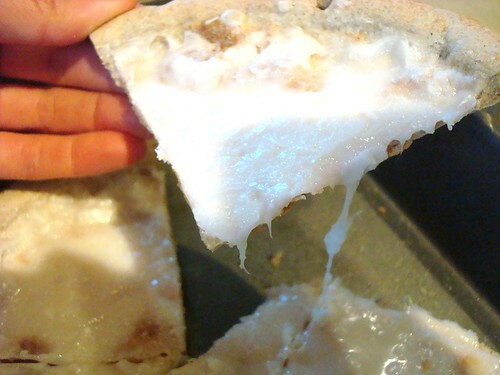 It's sort of like the icing that comes with pop-n-bake cinnamon rolls. Now, you're ready to get baking. As advertised, it's ready in 7 minutes! Now, I know it had said it didn't require a pan, but I didn't want icing goo on the bottom of my oven, so I did put it in a pan. I baked, and it began to do stuff. Bubble, bubble, toil and trouble. 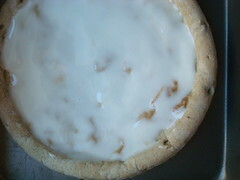 When I took it out of the oven, here's how it looked. Now, I will tell you, there was a brief, shining moment when I had somewhat high hopes for this dessert. It smelled awesome: like cinnamon and sugar and a soupçon of something else. I wasn't quite sure what yet, but at that moment I wanted to find out. My hopes began to fall. It started with a perfect consistency--soft on top, crispy on the bottom. Then, as it cooled, it began to firm up, then harden, then harden to a crispy, stiff-as-a-board type consistency. I needed a very large and very sharp knife to slice that baby. 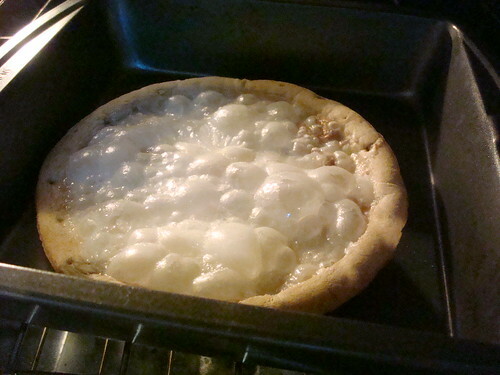 As you can see, I could only score it with a pizza cutter--it didn't even make a dent in that crust. Once I finally got it sliced, I took a bite. Now, let me tell you...I'm not a dessert snob. I can enjoy a Pop-Tart or Little Debbie Snack on occasion. I tell you this so that you will know that I am not the type of person who would just bash a sweet because it was cheap or "low class". 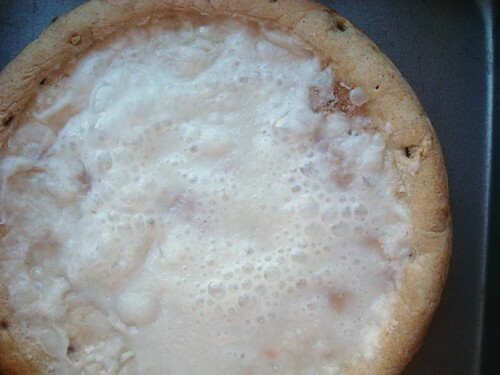 But the truth is, his dessert pizza was absolutely terrible. It may not be the worst dessert I have ever eaten, but no others come to mind just at this moment. People occasionally will say how something tastes "like cardboard". I generally think this is a bit of an exaggeration. But in this case...it actually did taste like cardboard. 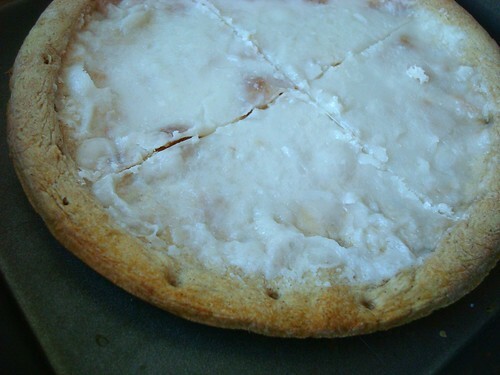 I had discovered the alluded-to soupçon of "something else" in this dessert pizza's aroma. I tried another bite, but it was hard to navigate the beyond crispy crust without breaking a tooth or ten. 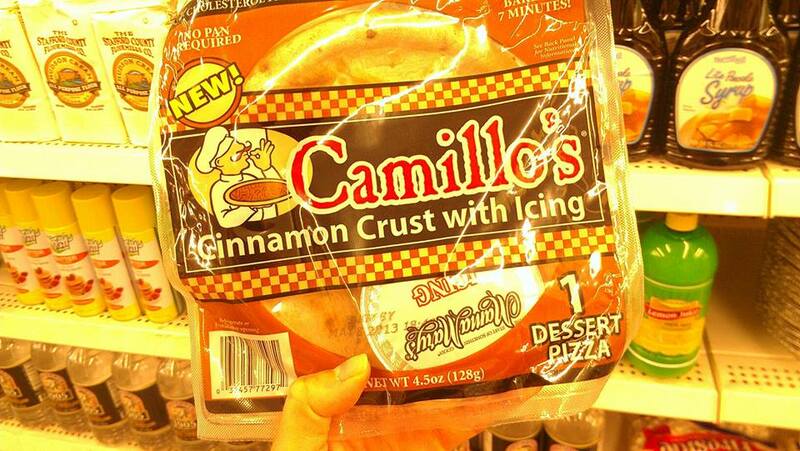 The final verdict on dollar store dessert pizza? Please, let my curiosity be your cautionary tale. Don't do it. 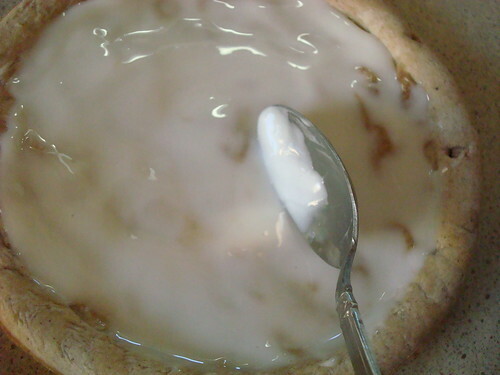 What's the worst dessert you've ever had?